With SEO adviser you get valuable tips and insights on how your opencart store should be optimized per page, helping you increase your SEO rating and grow your search traffic. You will never miss a single SEO opportunity. 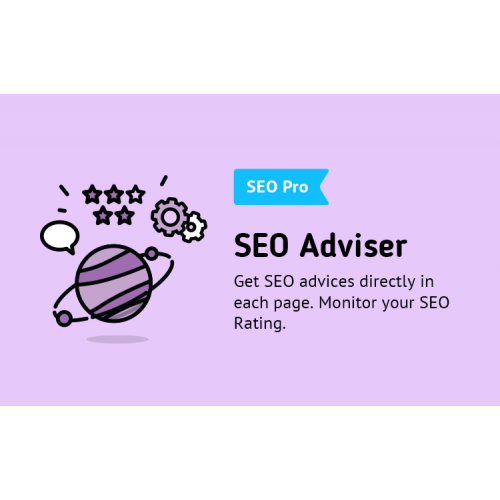 Seo adviser is responsible for calculating your SEO rating based on all the SEO insights, gathered from other SEO modules. Every SEO module you install adds their own insights so the SEO adviser gets smarter all the time. Now you can view all the insights directly on you frontend. Browser your webshop as an admin and immediately see the SEO rating as well as details on how to improve it. Click edit to implement the changes. It is that easy. Feel something is missing – just add it. You can improve the SEO rating by adding you own seo insights. With our built-in API, and detailed documentation, it is easy to get started. This module adds more insights to your SEO Adviser that go into your SEO rating. So you can be sure to optimise your Meta like a pro.